Watch Japan Drama and learn Japanese language. Introducing and review one Japan Drama each week to keep up with Japanese language learning. Hanzawa Naoki (Sakai Masato) 堺雅人 joins Tokyo Chuo Bank and determine to climb to the top position of the banking industry. His goal is to find the banker who causes the death of his father indirectly by denying loan to help overcome his father’s factory financial crisis. He also vows to change the banking system in order to help factories or companies which are facing financial crisis over come and survive challenges. In order to achieve his goals, being a top elite employee is just not enough. Especially when he is working in banking industry, one single mistake is enough to remove him from the front line elite work force. After working in the bank for several years, Hanzawa Naoki (Sakai Masato) 堺雅人 manage to become division head at Osaka Nishi branch. This is where he starts to face real challenge or career threatening situation from his manager. He was forced by the branch manager to grant an unsecured loan to a factory which later ends up bankrupt. In order to continue his career as a banker, he must find a way to recover the money loaned regardless of whose fault it is. This is the first case he encounter which exposes the unethical deal within banking industry. The first thing that comes in mind after watching the drama for few minutes is the work passion and the determination to solve problems. It just seems like Hanzawa Naoki is working day and night without getting any rest. Although the biggest satisfactory is watching Hanzawa Naoki out beat his boss with his outstanding working ability and intelligent, it is also very comforting to watch Hanzawa Naoki help his customers or clients restructuring their business or company. I suppose many employees dream of becoming just like Hanzawa Naoki but in reality boss usually is the winner. Going against boss or employer usually ends up badly. The truth is you won’t be able to perform well and advance in the company if the boss does not like you. Even if you are just being professional in your work, you still won’t get the opportunity. The best is just change job or switch to other company. In this drama series, Hanzawa Naoki successfully beaten two bosses and he did it with the help of his friends and colleagues. Even his wife contributes a lot in his success. In other words, he is not alone in his path to success and he chooses to believe in the people he work with, even when one of his friends betrays him. Although Hanzawa Naoki (Sakai Masato) 堺雅人 is the main character which most viewers are focusing on, his opponent such as Asano Tadasu, Kurosaki Shunichi and Ohwada Akira plays a big role in making this drama successful. Their arguments and speeches make up the best part of this drama. No doubt the facial impressions of several actors are impressive. You might even feel the heat or flame when they are having arguments. “An eye for an eye.” That’s the quote Hanzawa Naoki半沢直樹 often uses when he speaks of his enemy or the person who framed him. And it’s not just an eye that he is trying to get back, but 10 times or 100 times of repay. The determination, anger, patient, intelligent and faith are well express as Hanzawa Naoki半沢直樹 deals with his opponents. Worth watching. This is a typical drama about an employee who goes against corrupted boss and win. Especially if you are an employee or salary man who dislikes your boss or has opinions about the way your boss run things, this drama really can brighten your day. I suppose this is the reason why this drama receives a high viewing rate in Japan. Haga Ineko (Kichise Michiko) 吉瀬美智子 used to be a school teacher before she quits her job and trying to get married. Instead her supposed to be husband dump her at the last minute right before the wedding. While she’s wondering what to do with her life without a husband and a job, her friend persuade her to become a substitute teacher for a trouble class, a class which not a single teacher can stay on for long. Many of them gave up or transferred without any reasons. As Haga Ineko (Kichise Michiko) 吉瀬美智子 steps into the class, she instantly felt the threats and difficulties from the children. There is nothing new about the story of this drama. It’s just a story about a responsible teacher trying to fix a problematic class. Although Haga Ineko (Kichise Michiko) 吉瀬美智子 is the main cast in this drama but still the attention is on the children. These children really are good in acting. Some of the bully actions might not so comfortable to watch, especially when it’s carry out by the children. Even so this drama is still nice to watch. We just love to watch how the teacher working hard to direct each and every children into the right path. There is nothing special about the teacher but with a nickname call steel. Children are the main focus in this drama. You’ll find lots of familiar faces within as some of the kids often appeared in other dramas too. Nice to watch. This is a typical drama about a teacher trying to teach or educate a class of children. It’s another tough mission with problematic children. But still, audiences able to witness the success of teacher at the end. Tsutsumi Shinko (Shinohara Ryoko) 篠原涼子 was just release from prison for deceiving charges. Due to her criminal record, she was unable to find a job. Tsutsumi Shinko (Shinohara Ryoko) 篠原涼子 was then specially hired by government to audit and investigate civil servants who spend government funds for their own benefits. Tsutsumi Shinko (Shinohara Ryoko) 篠原涼子 was specially hired to deal with high ranking civil servants who are good in manipulate the laws. 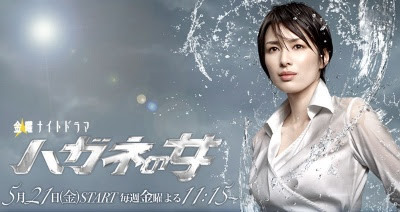 As it is very difficult for the board of audit special investigations division to go against and bring down high ranking crooked ministers, Tsutsumi Shinko (Shinohara Ryoko) 篠原涼子 has to fight from a different way, a way which she is very good in before she goes to prison. This is another drama created for Shinohara Ryoko (篠原涼子). You’ll find lots of similarities when compare with previous Shinohara Ryoko (篠原涼子) drama. If you like her previous drama, then this drama is for you. Although there won’t be much surprises and new stuff, it’s still nice to watch. This is not the first time Shinohara Ryoko (篠原涼子) pair with Oizumi Yo (大泉洋) and their interaction of jokes still as good as before. This time, there is couple of new actors which brings in a lot of new ingredients. There are some parts of this drama that are difficult to understand when it comes to accounting and calculation explanation. But still we can understand clearly which of the areas government civil servants tend to take the people’s money legally. The flashing huge calculator looks nice. But still I think this drama exposes ways of how government servants spend taxes for personal benefits. Nice to watch. Although the topic of this drama is a bit bored as it’s related to taxes, accounts and calculator, but still it is interesting to watch. The drama gives you a feeling of fighting evil with evil. Miyazawa Tomomi (Kuroki Hitomi) 黒木瞳 just move to a smaller house due to financial problem as her husband lost his job for about a year. Life has been difficult for Miyazawa Tomomi (Kuroki Hitomi) 黒木瞳 lately so she decided to attend her class reunion party to cheer herself up. It has been around 30 years since she graduated from the school which soon to be united and combine with other school. At the party she reunite with her old friends Sugiyama Kosuke (Takahashi Katsunori) 高橋克典, Nishikawa Yoko (Saito Yuki) 斉藤由貴, Okubo Shinichi (Mikami Hiroshi) 三上博史 and many more. They have a good time catching up with the old times even though they are going through difficulties. Everything seems normal that night as they went back home separately. The next day morning Miyazawa Tomomi (Kuroki Hitomi) 黒木瞳 was told two of her friends did not went home but has run away from home as lovers. She was shock as why people can just leave everything behind without considering the consequences. This drama is about love. A group of friends and classmates are trying to recall the feeling of love which they experienced back in high school. Love is essential at any time, any age. Even if at middle age, people are still hunger for love. Just that as we live through half of our life, any decision we make are crucial because we have too many things on our shoulder. We cannot simply just follow our heart and pursuit for love without thinking about consequences. The relationship and love in this drama is complex but yet simple. As this is not love in first sight drama, it takes time to interpret the relationship between characters. I suppose the acting ability of the actors has successfully brought out the complicated feelings among each other. No doubt these actors look very much younger than their age. I suppose makeups and skin care products play a significant role in preserving their youth. Nice to watch. Although there aren’t any leading young actors in this drama but the performance of these matured actors are brilliant. Love stories are always interesting and fascinating regardless of any ages. Worth ***Definitely worth the time to watch it. Nice **Good but something is missing. Fun **Gives you a good laugh. Interesting **Gives you something to think about. Watch it if *Just killing time.